Toronto! We all know that it’s the site for TBEX 13, but did you know these other facts and factoids about the city? Our good friends at Toronto Tourism are trying to tempt us with additional reasons to visit. Is it working? Toronto is the capital of the province of Ontario and the largest city in Canada. Toronto is a growing, multicultural city that sits on the north shore of Lake Ontario. The City of Toronto has a population of about 2.6 million people and the Greater Toronto Area (GTA) has about 5.5 million. Toronto is the 5th largest city in North America (after Mexico City, New York City, Los Angeles and Chicago). Canada’s financial centre – The Toronto Stock Exchange – is North America’s 3rd largest stock exchange by value traded. Toronto is centrally located between Chicago and New York, and is roughly parallel with Boston and Northern California. Half of Toronto’s population was born outside Canada; 200 different ethnic origins are represented with 130 languages and dialects spoken. 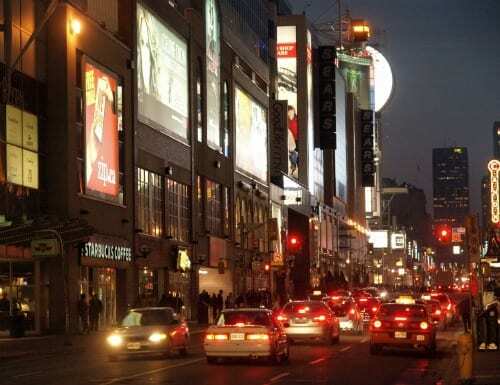 Toronto has the longest street in the world, Yonge Street (in photo above), which starts in Toronto and ends 1,896 kilometres (1,178 miles) later in Rainy River, Ontario. Toronto is made up of dozens of ethnic neighbourhoods including five Chinatowns, Kensington Market, Greektown, 2 Little Italy’s, Little India and Koreatown. Toronto has over 9,000 restaurants. Toronto has over 43,000 hotel rooms. There are over 70 film festivals held in more than 20 languages every year. The city’s primary airport, Toronto Pearson International Airport, is Canada’s busiest and has more daily flights into the U.S. than any other airport in the world. The Toronto Transit Commission (TTC) is a vast network of subways, streetcars and buses that service about 1.6 million passengers daily. 73 Business Improvement Areas (BIA), including the world’s first BIA, the Bloor West BIA, formed in 1970. There are over 1,600 named parks comprised of over 8,000 hectares of land (ravines, valleys, woodlots, parks, beaches, golf courses, destination parks, parkettes) and over 200 km of trails, many of which are suitable for biking and walking. Toronto’s waterfront is 76.5 meters above sea level; shoreline stretches 43 km (as the crow flies) or 138 km if you factor in the bays and islands. 307 km of rivers and creeks run through the city; all flow into Lake Ontario and are part of the Atlantic Ocean Drainage Basin. Toronto has a total of about 10 million trees, approximately 4 million of which are publicly-owned trees. These include approximately 600,000 street trees (e.g. located on public right of ways on boulevards and commercial trees in sidewalks, etc) and 3.5 million trees in parks, ravines and other natural areas. Legendary baseball player Babe Ruth hit his first professional home run in Toronto on September 5, 1914. He was playing for the minor league AAA team the Providence Grays against the Toronto Maple Leafs at the Island Stadium, which stood on Hanlan’s Point, near where the Island Airport is now. The ball landed in the bay. St. Lawrence Market is the oldest continually operated market on the same site in North America. There has been a market on the site since 1803. The brick building that is part of the entrance is what remains of Toronto’s first city hall, built in 1844, and used until Old City Hall was finished in 1899. The current building was built around the core of the old city hall around 1900. Toronto was the birthplace of Canada’s first postage stamp. Sir Sanford Flemming designed it in 1851 and it went into use that same year. Ernest Hemingway’s first job was at the Toronto Star in the 1920s. The Elgin and Winter Garden Theatre is the world’s last operating double-decker theatre with two separate and distinctive stacked theatres. It was built in 1913, and is celebrating 100 years this year, and houses the largest collection of vaudeville scenery. The longest street in the world! (Yonge Street) For some reason, I find that way cool.